The Japanese Academy of the Rockies, a 501(C)3 organization, will sponsor a charity concert to raise funds for the Japan disaster relief to provide children who are suffering from the Massive 9.0 magnitude Earthquake and Tsunami which occurred on March 11 displacing over 12,000 people and 8,000 death. 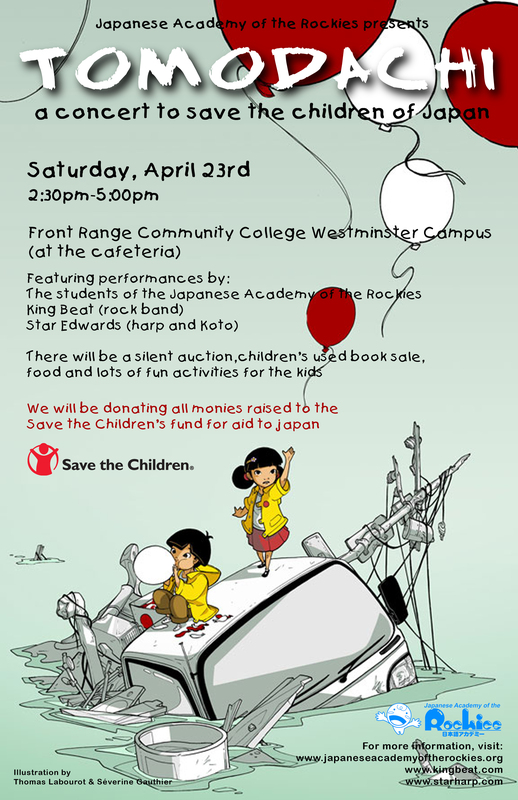 The concert will be held on April 23rd 2011 from 2:30 PM to 5:00 PM at the Front Range Community College Westminster Campus. The event will feature vocal performances by the students of the Japanese Academy of the Rockies, “Kingbeat” a rock band, along with “Star Edwards” a folk harpist who also plays Koto. See the event poster here. The donation will go to Save the Children - the Japan Earthquake Tsunami Children in Emergency Fund. The Japanese Academy of the Rockies was established in September 2006 to teach younger children Japanese language. We believe that the children who are born in the United States and live here permanently need a different Japanese language education from the traditional Japanese school style education. Instead of focusing on reading and writing, we focus on communication skills in Japanese.